One of the most common uses of Excel is entering quantitative data to be analyzed using functions. Whenever a numerical value is entered in Excel, it can be formatted in one of many ways. Let's take a look at these formatting options to get a sense for how we can use them to make our spreadsheets clean and easy to read. Number. 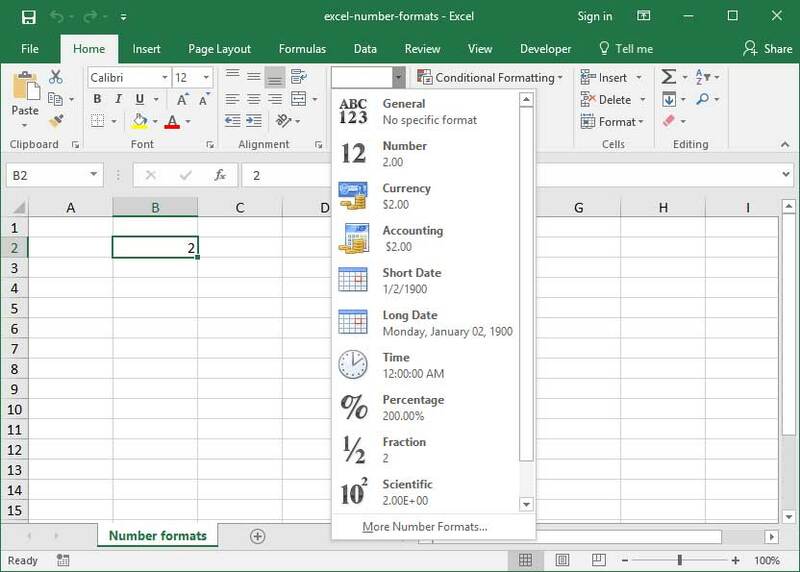 Excel will format your input as a generic number with commas between the thousands digits. Currency. 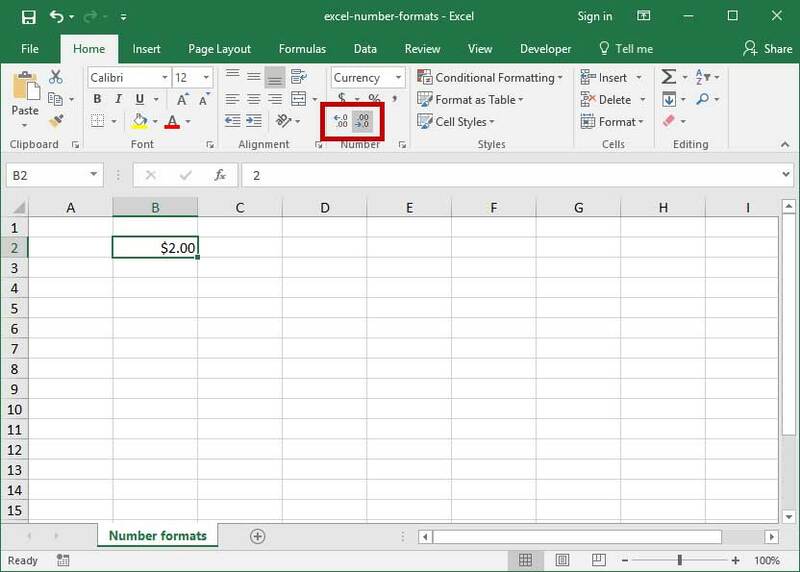 Excel will format your input with a currency sign in front of it and two trailing digits after the decimal point. Accounting. Same as Currency format, but currency sign will align to the left-hand side of the cell. Date. Excel will format the given input as a date. Note that dates in Excel are represented as numerical quantities — see our date and time function overview for more information! Time. Excel will format the given input as a date / time. Times are also represented as numerical quantities in Excel. Percentage. Excel will format the given input as a Percentage. For example, an input of .76 will read as 76%. It's important to note that number formatting will not actually change the value of cells in Excel. The number 2 formatted as a number, currency, accounting, or even percentage will not change it's actual value — it's still stored as the numerical quantity 2 in Excel. 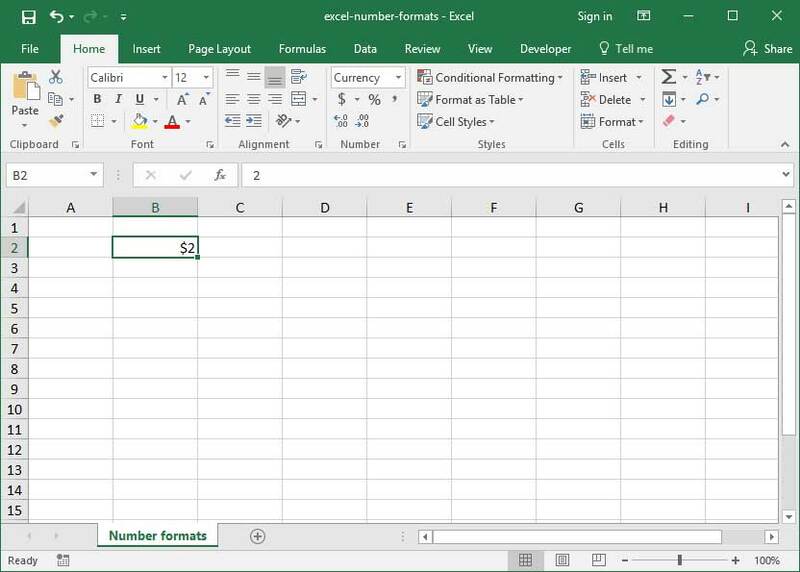 Whenever you're working in Excel, make an effort to align the formatting of your numbers — including both formatting style and number of decimal places — with the information you're trying to convey to your viewers. If a high level of specificity is required, use many trailing decimal places. If not, consider eliminating decimal places to round to the nearest whole number.